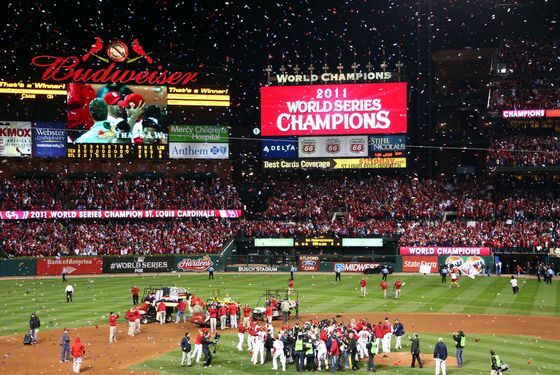 The St. Louis Cardinals beat the Texas Rangers 6-2 last night to win the World Series. The last two months of baseball -- not just Cardinals baseball, but baseball, as an institution, as a pastime, as a calling -- have been as thrilling an end to a season as any I can remember, and it's important to remember that no one thought any of it would happen. Remember, at the end of August, many observers were complaining that the baseball season had grown dull, that everyone already knew the playoff teams (Philadelphia, Milwaukee, Arizona and Atlanta in the NL; Yankees, Boston, Detroit and Texas in the AL) and that baseball should so something (like, say, add another wild-card team) to fix the "problem" of a pointless September. What happened to our pennant chases, the cries went. And then the Cardinals and Rays got hot, and the Braves and Red Sox fell apart, and there was that amazing final day of the regular season and then the thrilling postseason and that Game Six and good heavens for two months now it has just been madness. I'm not going to get into too many details of the Cardinals' win last night, partly because I still have beer in my eyes from Foley's last night and partly because the game itself was not inherently exciting. (Unless of course you are a Cardinals fan and think it was pretty much the most beautiful game ever played.) It was almost as if, after the last two months of lunacy, baseball gave us a break with Game Seven, just so there would be fewer cardiac incidents. It was just a normal game. No "malfunctioning" bullpen phones, no wild comebacks with only one strike left (let alone two of them), no three-homer outbursts. The Rangers scored two runs in the first, the Cardinals scored two of their own to answer, Allen Craig hit a homer and the Cards scored two runs on no hits in the fifth ... and then the game just sort of seemed over. Everyone, most of all the Rangers, were too exhausted to fight it. It's probably for the best. Another night like Game Six, and there'd be a lot fewer people alive this morning to enjoy it. But this year has been the best one. This is a team that simply could not be killed. I do not know why that is. Maybe it's the manager. Maybe it's some sort of clubhouse mojo. Maybe Lance Berkman is a cyborg. Maybe it's just random chance organizing in a way that maximized drama. I do not know, and I do not care. I just know that we have all just been the best two months Major League Baseball has seen in a long time, and at the end of it, the St. Louis Cardinals, a team everyone (including Cardinals fans, and even sorta including the Cardinals management themselves) wrote off, were the last team standing. To watch a team that has infuriated and teased and made their fans crazy all season, to watch that team suddenly become an unkillable force on the biggest stage ... it's better than the other years. This is the one I'll remember the most. This was the best one. And Major League Baseball, over these last two months, has never been better. We're all lucky, Cardinals fans, Rangers fans, baseball fans, sports fans, residents of earth. This is as fun as this can get. Now, if you'll excuse me, I need to go wash the rest of this beer out of my hair.